The purpose of this article is to take a look at the Vokul VK3 Scooter and to see how it holds up against a close inspection. There are plenty of brands out there, but not all of them will give you the support and power that you need to perform the big tricks. In doing so, we’ll take a look at the scooter’s features, functionality, and a few of its highlights. Need a quick look at the scooter? Make sure to check out the video below. Let’s begin! Feature-wise, the Vokul V3 is definitely a standout. Everything about this scooter really feels like it’s made to help new riders to succeed. The build is not only strong enough to stand up to real tricks, but it is also light enough to help beginners put on strong performances. Overall, It’s a very sturdy, very stable scooter that’s fairly easy for an adult to put together. On top of that, this ride is going to hold up well to all of the abuse through which a new rider is likely to put the scooter. The Vokul VK3 is also an incredibly easy scooter to use. It doesn’t have any complicated parts or extra bits to get in the way of riding. It’s about as simple a scooter as you’ll find on the market, which means that your young rider can spend more time focusing on tricks than figuring out how to ride the scooter. By providing a simple ride, this scooter becomes one of the best on the market for learning how to tackle professional-level riding from scratch. This makes it perfect for teenagers and those beginners who want more from a scooter than a simple stroll through the city. Frame is lightweight but strong. Perfect size for younger teens. Needs adult help for assembly. Some issues with the stem coming loose. In addition to the big features of the scooter, the Vokul V3 has a few other neat selling points. First and foremost, the scooter appeals to people through its cool looks. This ride shows a pleasant aesthetic that really sets it apart from other scooters you’d find at the skate park. However, it doesn’t overdo it so as not to turn professional scooters away. While aesthetics certainly shouldn’t be the main selling point for a scooter, they don’t hurt here. The overall look is definitely a point in favor of this scooter. It’s also nice to note that the handlebars really are strong enough to stand up to most tricks. They don’t tend to wobble or move, even when there are some other small issues with the stem. This really ups the stability of one’s ride and makes the unit far more suitable for tricks than one might expect. In short, you’re looking at a great scooter. This model will help new riders to feel confident even when they’re starting to take risks. Assembling the Vokul V3 Scooter isn’t all that difficult. Most scooters aren’t nearly as hard to put together as a bike, with only a few moving parts. In fact, this scooter really only requires you to do a little bit of work in order to get it moving. The most complicated parts of the scooter are already in one piece when you take it out of the box. Most of what you’re going to do will involve attaching the handlebars and neck of the scooter. The former can be done with just a few twists, while the latter only needs the help of an Allen wrench to get the job done. Moving on, it’s recommended that an adult threads the neck of the scooter into the other end of the vehicle, as it is fairly easy to strip the threads down to nothing. Never over-tighten the handlebar or the neck. Doing so might end up breaking the scooter. Scooter maintenance is, fortunately, not all that difficult compared to some other vehicles. You don’t have to worry about refilling tires with air or using any type of fuel. Nonetheless, what you’ll want to keep your eye on is the level of wear and tear. Always check your wheels to make sure they aren’t broken or cracked before you ride. Likewise, wiggle the handlebars to make sure they haven’t come loose. If anything feels loose, tighten it up before you start riding. Beyond that, your biggest maintenance task will be to keep the vehicle out of the rain so it doesn’t rust. This very quick video from Vokul brand will give you a good idea of how the scooter performs at a skate park. While you won’t see much in terms of maintenance, you’ll get a good idea of what the scooter can do. 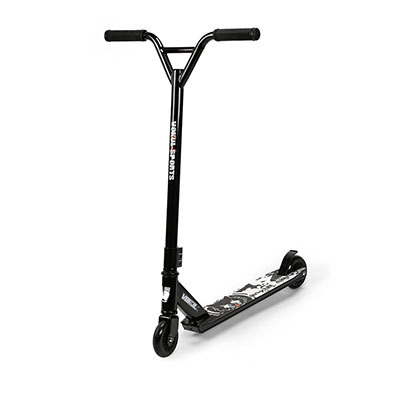 All in all, the Vokul VK3 Scooter is a good starter ride for any young teen who wants to get into the world of professional scooters. It stands up to a lot of punishment, even if it ultimately is the kind of scooter that can be outgrown quickly. If you’ve got strong opinions on this scooter, don’t keep it to yourself – be sure to get in contact with us and let us know! I found the issue with the Vokul VK3 Scooter was the assembly. The writer stated that it is not difficult to assemble but let me tell you, it was one of the biggest pains I had to deal with. How is it simple? Hey, Dan! Writer here. Many online user reviews mentioned that they had an easy time assembling this scooter once they received the package. However, this topic may be subjective, since it depends on the strength and expertise of the user and the available tools at hand. Hope that your scooter is now fully assembled and ready for some stunts. Don’t forget to follow our Facebook page to stay tuned to the latest kart and scooter reviews and guides! I got a surprise gift for my birthday which was last month, and it was the Vokul VK3 Scooter. I have never ridden one before and I love it because I found it to be easy to use for a newbie like me. Thank you SO much for putting this up here as I have been strongly considering to get the Vokul V3 scooter. I have done some research but this site really shares so much about it. I still have not made my choice though.